Finally, we get another Noxian! It’s about time, now give me Keiran (despite the fact that he’s been killed) and we’ll be cool. Or Kassadin’s daughter, either works. Speaking of cool, Darius is all kinds of cool in terms of his design. He’s a big, pissed off guy with a big, pissed off axe. The model is all kinds of detailed and is easily one of the best that Riot’s put out in a long time. Darius’s voice is a particular point of note for me; he sounds incredibly familiar, yet I can’t place it. If anyone has any idea, let me know and you shall receive many, many thanks. 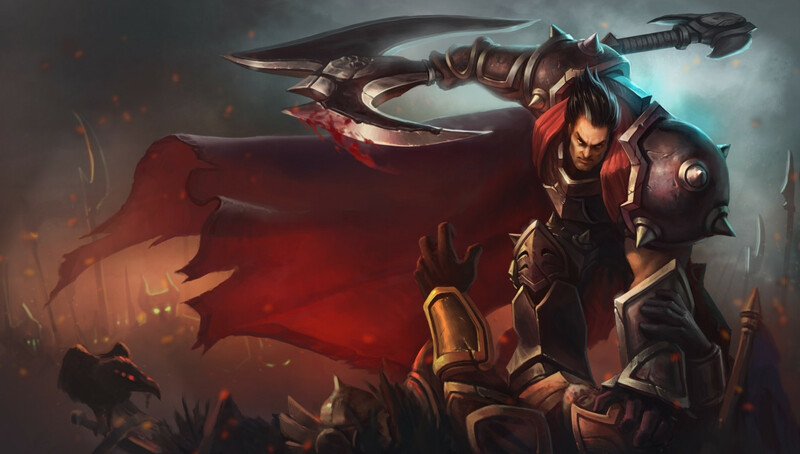 Darius’s playstyle is as cool as he is, mostly because I’m a big fan of DoT (damage-over-time) abilities. His Decimate is a bit wonky, admittedly, but I’m just not used to the radius of his axe, nor am I entirely sure if larger champions (Hecarim comes to mind) take damage from the shaft or the blade if they’re right next to you. My guess is shaft. I’ve never really noticed a huge effect from Crippling Strike, except against towers. I’ll admit that it’s great for last-hitting minions, but if you need to chase, use a speed buff or Apprehend (which does not damage, only pulls). His ultimate is incredibly satisfying to use, especially in teamfights. Even if you don’t get a kill, you’ve still pretty much taken someone out of the fight. As far as skilling order goes, I’ve been maxing in the order of Q/W/E. I’ve been doing some experiments with E (Apprehend) before W (Crippling Strike) for the early armor penetration, but I’m still undecided. It seems situational at best, considering that Apprehend’s active doesn’t damage. The most you get out of it at rank five is a halved cooldown (from 24 to 12 seconds). In terms of building, I’ve been going with my bruiser masteries and runes, which gives me a reasonable amount of survivability and a pretty nice amount of armor penetration. I may switch out the armor pen for movement speed down the line, though, since Darius has a problem catching people without Apprehend. As far as items go, I’ve been pretty much going by what Phreak said. Depending on how I’m doing I’ll grab a Heart of Gold or Hexdrinker first, usually followed by Chainmail. After that, it depends on who does the most damage to me. If it’s a caster, I’ll grab Maw of Malmortius and if it’s an AD champion I’ll get Randuin’s Omen. I find that, because of his ultimate, you can kind of set damage aside if you need to. You’re most useful when you’re up front spreading your bleeds out. Anyway, if you’re looking for a new bruiser who does absolutely insane damage without sacrificing too much survivability, definitely give Darius a shot. Although I suspect he’ll be nerfed by the next patch, he’s still all kinds of fun to use. And that’s me done for now! As always, thanks for reading and have a good’un. This entry was posted in First Impressions, League of Legends, Video Games and tagged darius first impressions, darius the hand of noxus, league of legends darius, lol darius, lol new champion. Bookmark the permalink. Let’s hope, he’s all kinds of fun to play. Definitely give him a shot when he’s free over there (which should be whenever the /next/ guy comes out for you…)! Varus is also super-fun. Sniping is so satisfying.